Limbo's success allowed Danish developer Playdead to purchase itself from investors and fund a new, more ambitious title. After a successful showing on Xbox Live - and later on PC and PSN - Limbo developer Playdead has managed to pay back investors that initially got the company on its feet. This move grants the studio a greater degree of financial and creative control, though Limbo indicated Playdead wasn't exactly churning out military first-person shooters to begin with. Studio founders Arnt Jensen and Dino Patti funded Limbo's development with help from the Danish government. When it became clear that funds wouldn't allow Playdead to fully realize its game, investors were brought on board to foot the rest of the bill. First released during Xbox Live's 2010 Summer of Arcade, the eerie, atmospheric platformer quickly amassed a following among critics and consumers alike. 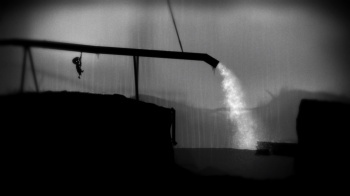 Escapist Senior Editor Susan Arendt gave Limbo a five-star rating, praising the game's imaginative environment and clever puzzle design. Patti announced last October that Playdead is working on another game, and that it will be "very different" from what we've seen in Limbo. However, he also said Limbo will "forever and always" be exclusive to XBLA, so it seems anything can happen. This new game - unlike Limbo - will be built in the Unity engine rather than a proprietary one. "It was just too much work," Jensen told Edge in an interview. "It's like having a double product, doing both engine and game. And our next project is a little more ambitious than Limbo so there are a lot of things we don't want to make from the beginning." For those hankering for another Playdead game, I'd recommend you not hold your breath. "A good game takes time," Patti said. "I think the new production will take at least three and a half years."